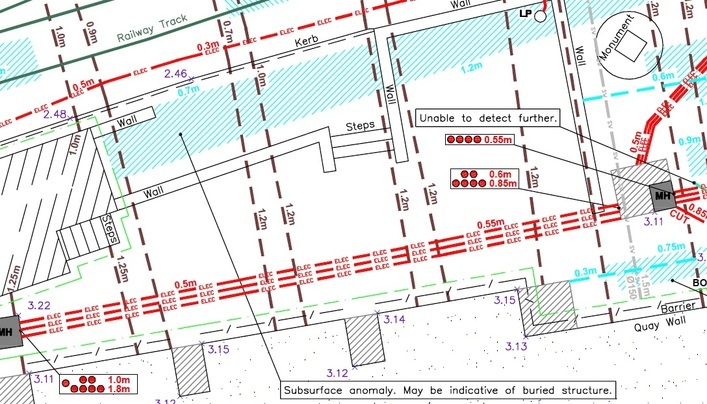 A GEOTEC Underground Utility Mapping Survey is one of the most comprehensive services on the market, compliant with PAS 128 standard, utilising Electromagnetic Locating (EML) & Ground Penetrating Radar (GPR) as a minimum. Non-Invasive Underground Utility Mapping serves as GEOTEC's Core Business, where we have over 20 years' experience in detecting and mapping any buried known and unknown services and utilities that may be present within any given site. This comprises metallic and non-metallic services, including Water, Power, Gas, Telecommunications, Fibre Optics, Drainage and other linear targets.GPR can also detect and map subsurface anomalies such as voids and obstructions. Ground Penetrating Radar Data Post Processed. Cross referenced against Statutory Records. Permanent record at a single point in time. Overlay proposed design solutions to assist with clash management. Manhole Photo Schedules & Reports on request. Results can be fed into 3D & BIM software. Above all Underground Mapping reduces risk to those who dig and minimises disruption of the general public. Cover lifting, threading, signal induction. The responsibility for production of final results always lies with the Lead Surveyor; this task is not passed to anyone who has not physically carried out the survey. GEOTEC Surveys Ltd work in high risk environments such as the railways, substations, power stations, gas terminals, water treatment locations and pylon runs, as well as brown field sites, churches, schools, hospitals, urban environments and green field sites. We work with our clients to cause as little disruption to their operations as possible by using internal and external Traffic Management Measures & working Out of Hours where necessary.